Back in May we made a quick weekend trip to the Greek island of Kythera for the offical re-opening of the island’s archaeological museum. It had been shut for some years due to earthquake damage. The enforced closure turned into an opportunity to completely revamp the place, turning the two room building into a spectacular showpeice of modern museum display. It is well worth visiting if you happen to find yourself on the island. Oh, yes, the island is also a definite on the ‘to see’ list, complete with scores of Byzantine churches, Venetian fortresses, lovely seculuded beaches and great places to eat. The main town is called Hora (which simply means “town”). On the hilltop is a large Venetian fortezza looking South towards the stepping-stone island of Antikythera and from there to the West coast of Crete. 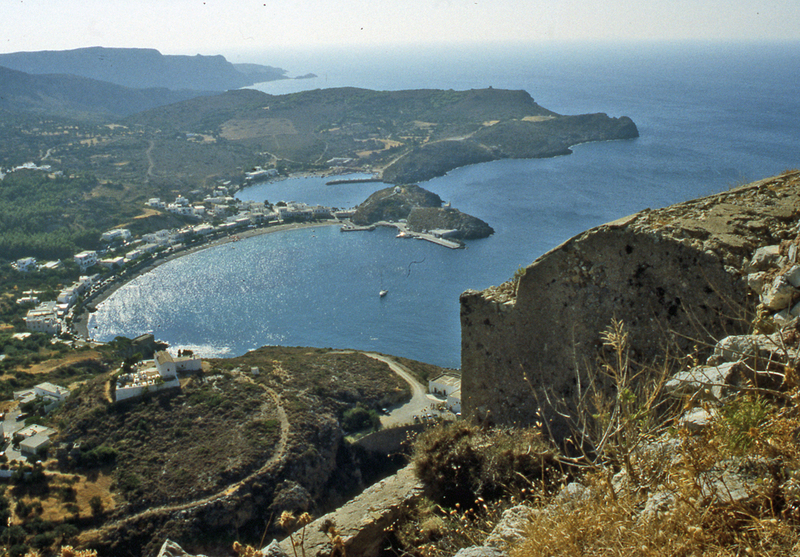 Below, seen from the fortezza is the harbour of Capsali (or sometimes spelled Kapsali). Capsali was at one time the major harbour complete with a Venetian quarantine station or Lazaretto, but now is a small fishing village. The ferries arrive at deeper ports, although one can occasionally see small sailing yachts docked in Capsali. Fish tavernas are lined up along the coast. 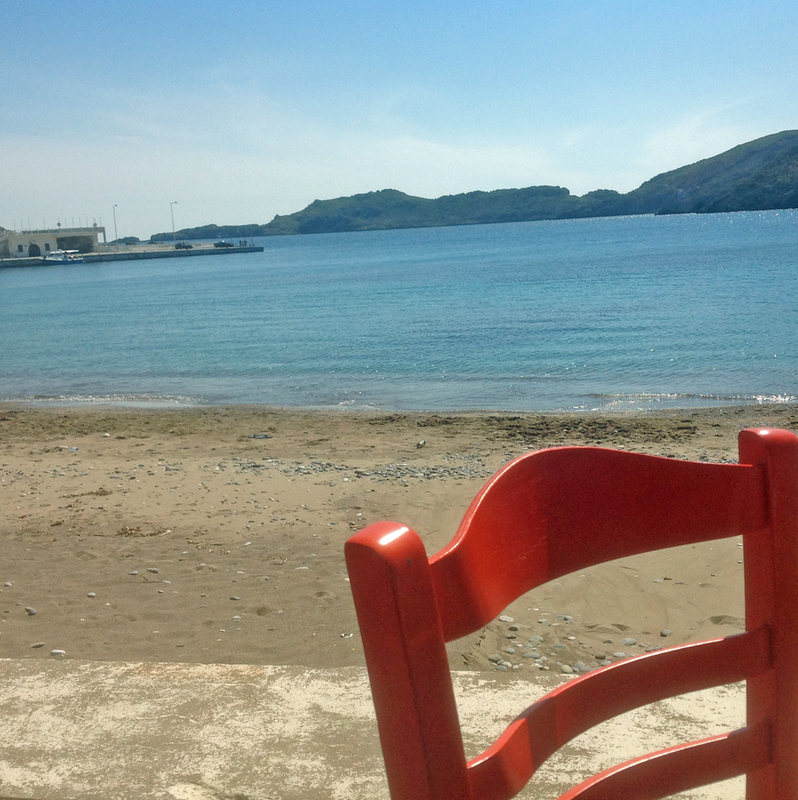 It is very restful eating at the beach with those perfect views over the blue Aegean sea. We ate at one of those tavernas where the fish was beautifully cooked, but it was this salad we got to go with the meal that had me reaching for my camera and taking notes on the ingredients. I fully intended to replicate it at home while the flavours were still fresh in my mind. Of course, I did with great success. A wonderful cold salad that goes well with any picnic, BBQ or outdoor patio dinner. Exceptional when served with fresh grilled fish. Soak both the beans and chickpeas in cold water overnight (though I used pre-skinned chickpeas that did not require pre-soaking.) Cook the beans, chickpeas, lentils and farro separately – starting with cold water and skimming any foam that appears once it boils. The beans and chickpeas may take about an hour or more to cook, but the lentils and farro will take less time. Test periodically for doneness. Drain and let each of these ingredients cool. To save energy and only hot up the kitchen once in this summer heat, take a tip that is just as energy and labour saving in summer as in winter from Francesca @ Almost Italian. Cook twice the amount and freeze half for future use – for another salad or in other recipes. Put the cooked ingredients in a large bowl and toss to mix. Clean, cut in half and de-seed the tomatoes before roughly chopping the firm flesh and adding it to the salad. Chop the spring onion, including some of the tender green part, and finely chop the dill. Add these to the bowl. Add the raisins as well. Carefully mix. In a separate bowl whisk the sugar in the red wine vinegar until the sugar dissolves. Pour this on the bean mixture and mix. Add as much olive oil as it can take – usually about the same amount or a little more as the vinegar. Test and add salt. It will need it as the beans, etc. were cooked without salt and the salad will be bland. Toss the whole thing together and enjoy. Leftovers are a great addition to both bread salad or pasta salad. t wait to try it in summer. would love to eat it beside that view too. Thanks Debi- must keep this somewhere safe for warmer days. Thanks Francesca, it is very good. I’ve made it numerous times now. The view was wonderful. We were there just before the main tourist season starts, so it was quiet and peaceful. And, the weather was warm, not HOT like it is now. I knew you would like this. Beans are fantastic – inexpensive and packed with flavour and nutrition. What a stunning view, it looks beautiful 🙂 and a gorgeous salad! The whole island is full of stunning views. And yes, the salad was beautiful to look at and absolutely delicious. Right up your alley. I wish… However, easy delivery might deprive you of the pleasure of making your own. Once the beans are done, it is a doddle. Tops salad, great bean tips from all and the blue of that sea!! Hoo ha! It really is blue – the sea, not the salad! I know you like beans, too, so this salad (minus the farro which contains gluten) is perfect for you. I wonder if you could substitute some other grain? Blue beans! Lol…yes, could use buckwheat, quinoa or millet. Buckwheat is a better match maybe? Buckwheat might be a bit strong a flavour. I’d try millet (only because I cannot stand quinoa). Too bad barley has some gluten, otherwise this would be the substitute I suggest. Perhaps it might be best to simply eliminate the grain element altogether. Let me know if you try it. Perfect and beautiful summer salad. It will not wilt! A trip to Kythera is at the top of my list. Thank-you. Even the tomatoes last for a few days in the refrigerator – mainly because they have been de-seeded and only the firm flesh remains. Kythera is definitely an island to visit. You will love it. Debi, that salad would be a meal in it self and very nutritious. Absolutely, Glenda. It would make a great summer meal – with a glass of chilled white wine, of course. Sadly I have never seen the Turkish coast and my visits to Greek islands is quite limited. Am hoping to change this on near future. Not everyone can tolerate beans, but I am glad I do. They are inexpensive, packed with nutrients and delicious. Here’s hoping you will see those Aegean islands in future. Me too – the freezer is stuffed with little bean packets! Good labelling helps. 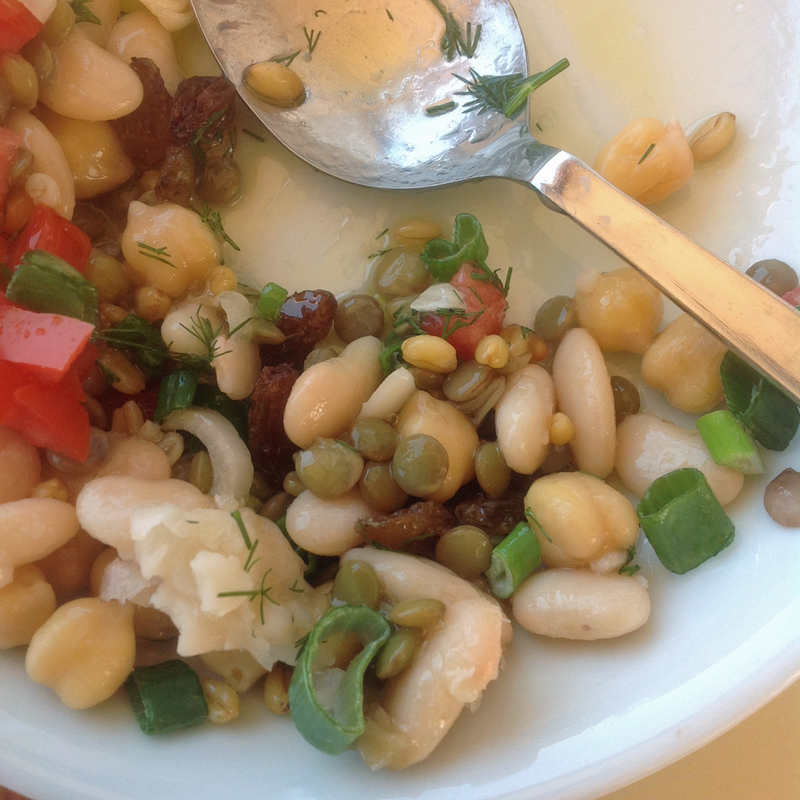 Love this salad and I think all bean lovers would, too. I also thought it might be nice with some steamed pencil thin green beans we get in the market here. Debi, The bean salad looks delicious. Nice photo of the view to Capsali. Kythera is a lovely island. We will need to visit the museum and fortress next time we are there. The new museum is great – still in the same building as the old one, but everything has changed. The displays tell the archaeological story of the island and the information panels are well researched and well written. Whenever we go to Kythera, we visit the main fortress. You sometimes get a clear view all the way to Crete. The island is a special place. Good to know. We had only a few hours in Hora and getting a cup of coffee was a priority for my husband. We’ll put the museum and fortress on our list for next time.